"I think there are a lot of music fans out there who aren't fixated on one style of music, who get their kicks from all kinds of different stuff. Man can't live on dance music alone, or rock, or anything else. So the people who'll be into me won't be into anything specific other than good music." He's talking about us guys. And he's right. Boom Bip's freshest opus, 'Seed To Sun', will cut across your listening habits and find a home uniquely its own. Not quite indie (way too funky), not quite dance ('cos dancing to some of it requires slo-motion tricks Peckinpah would be proud of), but perhaps one of the most absorbing journeys to the end of the night you can arm yourself with this winter. Your guide for 'Seed To Sun' is a Cincinnati native who first started exploring the world of illbient and avant-garde rap in the early 90s alongside his duties in various experimental rock bands. 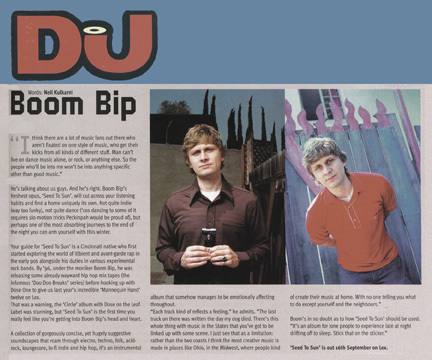 By '96, under the moniker Boom Bip, he was releasing some already wayward hip hop mix tapes (the infamous 'Doo Doo Breaks' series) before hooking up with Dose One to give us last year's incredible 'Mannequin Hand' twelve on Lex. That was a warning, the 'Circle' album with Dose on the Leaf Label was stunning, but 'Seed To Sun' is the first time you really feel like you're getting into Boom Bip's head and heart. A collection of gorgeously concise, yet hugely suggestive soundscapes that roam through electro, techno, folk, acid rock, loungecore, lo-fi indie and hip hop, it's an instrumental album that somehow manages to be emotionally affecting throughout. "Each track kind of reflects a feeling," he admits. "The last track on there was written the day my dog died. There's this whole thing with music in the States that you've got to be linked up with some scene. I just see that as a limitation: rather than the two coasts I think the most creative music is made in places like Ohio, in the Midwest, where people kind of create their music at home. With no-one telling you what to do except yourself and the neighbors." Boom's in no doubt as to how 'Seed To Sun' should be used. "It's an album for lone people to experience late at night drifting off to sleep. Stick that on the sticker."